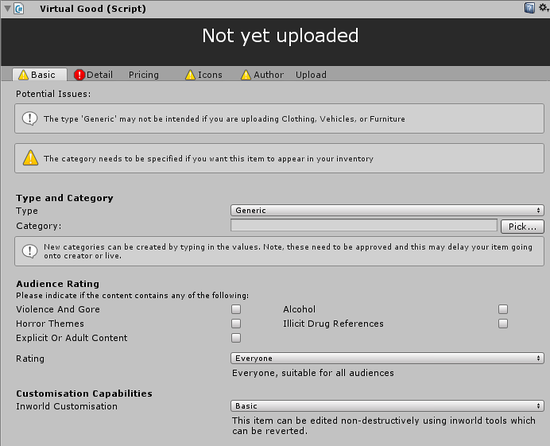 The virtual goods component is added to any item you upload; both for items that you are marking for sale, which will appear in the store, and items you are only uploading for your own use, including your own regions. The virtual good component has been broken down into sub-categories, making it easier for you to fill in the necessary information. Here you can find the Type and Category, Audience rating and Customisation Capabilities. Content Type is where you will choose the category for the content, for example, you will need to choose the Clothing content type if you have made an item of clothing. Category is used to place the item in the right item category. For example, if you have chosen the content type as Clothing, and you have made a jacket, you will need to pick the Item Category as Clothes>Tops>Jackets. Audience Rating is where you can choose the rating of your item. There are five ratings to choose from; Everyone, Teen, Mature, Adult, Explicit. There are also checkboxes here to check if your item contains certain content like violence or adult content. Customisation capabilities allows you to choose the level of inworld customisation allowed on your item. You can choose from basic, disallowed, full or source access. When you choose one of these, there is a small description of what customisation it allows underneath. Note: The type Pet is currently locked. This Pet type is some kine of legacy of Gojiyo, which is no longer used now. If you want to create a following minion as pet, you can choose generic to set the pet as a spawnable item, and set the category in pet if you want to put it in the shop. This is where you can add the primary description, optional fields and translation descriptions. The Primary Description is where you will choose the language of your description, add a name and add a description of the item you are uploading. You will also need to add in your brand name. Optional Fields include adding instructions on how to use your item and also has an option to add release notes if you want to. 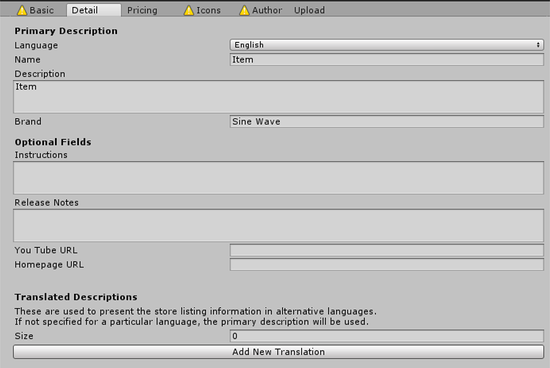 Translated Descriptions allows you to add a translation for your item name, description, instructions and release notes. To add a new translation, click on the ‘Add New Translation’ button. You will see a Language sub-header with a drop-down menu next to it. You can pick from the list of languages we have included in our Editor Pack. You can add multiple translations. You will need to add the translation in yourself. Here is where you can set the price of your item and set limits on promotions. Pricing has an option set the item ‘Not for Sale’, so if you make an item, but just want to keep it in your inventory for personal use, you can check the ‘Not for Sale’ box. Price Gold is where you set the price of the item in Gold. Gold is a premium currency. If you want to sell your item for just Gold, and no Silver, please put -1 in the Silver box, and then add your Gold amount to the Gold box. Price Silver is where you set the price of the item in Silver. Silver is the base currency in Sinespace. Promotions is where you can allow your item to be used in promotions. If you want your item to be used, check the ‘Allow use in Promotions’ box. You can also set the maximum discount amount in sales; The range is from 0 to 100% off. Your item will only be sold in sales if you check the Allow Use in Promotions box. Icons is where you can add the item store icon, inventory icon, and your brand icon. Image Store Icon is the icon used for the item in the sinespace store. You can take pictures of the item outside of Unity and add it here by copying it into your Project window, or you can auto-generate this by clicking on the 'Take Screenshots' button. This will auto-generate the inventory icon as well. Once you have clicked on the ‘Take Screenshots’ button, it might take a bit of time for the images to show up in Icons. The brand icon is the image you use for your brand. This can also be copied from the Upload Settings in Unity. To add your brand information to the Upload Settings, click on Space at the top of Unity and then click on Upload Settings. Under Defaults, you can add the Brand Name, add a Brand Icon, add a Copyright Label, and add a Default Inventory Icon. If you have added all of these, you can then go back to the Icons tab by clicking on your item prefab in the Project. Click on the Copy button under the Brand Icon heading to copy all of the brand information from the Upload Settings. You can also add the Brand Icon manually by adding the image to the Project window. You can do this by clicking on Assets at the top of Unity and then click on ‘Add New Asset’. The image will automatically be placed in your Project. You can then drag it from here into the Brand Icon image box. The Brand image must be 140x60px and a .PNG file. You can also add extra preview images which will be shown in the Shop. Expand the 'Extra Preview Images' at the bottom and add in your images. They need to be 1024x1024. Creator information is where you put the Developer Name and Copyright. The Developer Name is either the business name or your individual name. For the copyright, add your name or business name after the copyright 2018. You can also add the copyright information to the Upload settings, so the copyright info can be copied to other components. Upload is where you add the information for uploading your item. Status shows whether or not you have already uploaded your item to Curator. Resume Existing Item allows you to add a resume ID, so if you are re-uploading an item, you can put its’ resume ID here, and it will overwrite the old version. You can find the resume ID of any item by either going to curator.sine.space and finding your item, or, you can find it by clicking on Space at the top of Unity, and click on Items and Status. This will bring up a list of all of the items you have uploaded to Curator, along with their ID on the left-hand side. You can use Grid to enter a grid ID. This will restrict your item to this specific grid. Upload Content has the option of Automatic Submission. This will auto submit your item to being uploading to Sinespace. Once your item is on Curator, it will be reviewed by our team. If it is successful, the item will go live in sinespace.